Charles Stephen McHugh, trade union official, was born in Adelaide, South Australia, on 23 April 1887, the son of Edward McHugh, an ostler and labourer, and Annie, née McNamara. He was educated at Adelaide Christian Brothers College, a contemporary remembering him as ‘reticent [and] self‑contained’, but also highly articulate. McHugh was an accomplished athlete in his early years, but his strongest interests at school and as a young man were in public speaking and participating in the activities of literary societies, both of which he approached with great enthusiasm. He was elected first Labor ‘Premier’ in the ‘Union Parliament’, which had been convened by the South Australian Literary Societies’ Union; and served also as president of the St Patrick’s Literary Society. He harnessed these pursuits to what was to be the central preoccupation of his public life, the Australian labour movement. 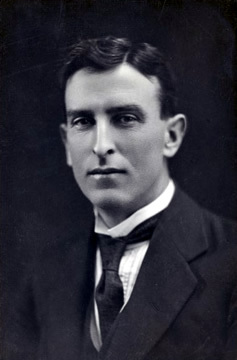 McHugh became a member of the Labor Party in 1909, later serving as president of the Party’s South Australian branch. He was also an alderman on the Thebarton Town Council. He often officiated as returning officer of the Australian Workers Union. To support himself, McHugh worked as a clerk and commercial agent. McHugh was elected to the Senate at the 1922 federal election, his term beginning on 1 July 1923. He served in two parliaments (9th and 10th), making his mark as a vigorous and impassioned debater and a stern critic of the ‘men, money and markets’ policies of the conservative Bruce–Page Coalition Government. In his first speech, McHugh set out his chief interests as a senator: the need to achieve ‘practical Socialism by a sensible method of nationalization’ and the importance of ensuring that governments retained the ownership of their large commercial enterprises rather than sanctioning their sale to private companies. He also spoke of the urgent need to open up the Northern Territory for further settlement. McHugh spoke as an advocate of electoral reform. He argued that first past the post voting, which had been employed for Senate elections between 1901 and 1919 until its replacement by preferential voting, should be re‑introduced, insisting that it was better understood in principle and practice by the majority of Australian voters and therefore constituted a fairer voting system. McHugh regarded the Federal Government’s sale of the Commonwealth woollen mills at Geelong to private industry as ‘one of the greatest political crimes ever perpetrated in this country’. He considered that, contrary to the government’s view, the productiveness of the mills would not necessarily increase as a result. In fact, McHugh was convinced that mill employees would be among the first to suffer as the new owners (large private companies) sought to make the mills more productive and profitable. I desire to place on record my protest against handing over to private individuals what should belong to the people of Australia. Alienation of Crown lands always appeals to me as daylight robbery. I am not saying that the Government is consciously acting as Ned Kelly would have acted, but, in effect, it is taking something from the people of Australia and handing it over to individuals who have no right to it, and who are not likely to develop it. that the Prime Minister would submit to the referendum the matter of the abolition of the Legislative Councils, or would endeavour to obtain for State electors a franchise similar to that enjoyed for the Senate. Every individual in the community is entitled to a full vote. Surely the upper house in the Commonwealth Parliament is of greater importance than the upper houses in the States. If every man and woman of the age of 21 years or more is entitled to a vote for the highest Chamber in the land, they should surely be permitted to vote for the election of representatives of bodies such as the Legislative Councils, which are subsidiary in comparison with the National Parliament. It is time the people awoke to the fact that they are not being truly represented, since the privileged class, by reason of its virtual monopoly of the representation in the State Legislative Councils, hold the power. The royal commission, appointed by the Commonwealth Government in September 1923, to inquire into the effect on trade and commerce of the Navigation Act 1912,comprised four members of the House of Representatives and three senators, including McHugh. It reported twice, on 20 August 1924 (an ambitious report which led to the amendment of the Act) and on 13 August 1925. The second report examined the Act’s effect on industry in New Guinea and Papua. McHugh was an active participant in the deliberations of the royal commission, and in the parliamentary debates leading to the amendment of the Navigation Act. He opposed the thrust of the government-sponsored Navigation Bill, branding it as socially divisive and a concerted attack on Australia’s trades unions. In dealing with industrial matters and problems, he called for greater resort to conciliation and arbitration. Predicting a politician’s prospects is rarely easy but, even allowing for the vagaries of political life, a successful parliamentary career could confidently have been forecast for McHugh. However, while visiting Tasmania with the joint public accounts committee in the winter of 1927, he became ill and was admitted to Struan Hospital, Launceston, where he died on Sunday 24 July 1927 at the age of forty. He was buried in Adelaide’s Roman Catholic Cemetery on 27 July 1927, the South Australian House of Assembly having resolved to adjourn as a mark of respect, not for the customary five minutes, but for almost two hours to enable the many members who had expressed a wish to attend his funeral service to do so. Tributes to McHugh from friends and political adversaries were generous. The Australian Worker’s anonymous obituarist, who claimed to have known McHugh since childhood, described him colourfully as ‘an unsleeping, diligent, alert, and shrewd political gladiator’. A political opponent, the Minister for Defence, Sir William Glasgow, praised McHugh as ‘a man of brilliant intellect’. On 21 February 1923, McHugh had married at St Mary’s Church, North Adelaide, Doreen Monica, daughter of Matthew Joseph Hogan, stipendiary steward of Walkerville, North Adelaide. McHugh’s parents, his wife and infant son, Teddy, survived him. Australian Worker (Sydney), 3 August 1927, p. 15. Advertiser (Adelaide), 25 July 1927, p. 9; Derek Drinkwater, ‘Political Education, the Model Parliament and Federation’, Legislative Studies, vol. 12, Autumn 1998, pp. 80‑89. CPD, 11 July 1923, pp. 894–900. CPD, 11 July 1923, pp. 897–898, 19 August 1925, p. 1503. CPD, 11 August 1926, p. 5235. CPD, 16 July 1925, pp. 1068–1073; CPP, Reports of the royal commission on the Navigation Act, 1924, 1925. The royal commission grew out of a House of Representatives select committee, appointed on 19 July 1923 to inquire into navigation matters. SAPD, 27 July 1927, p. 165. Australian Worker (Sydney), 3 August 1927, p. 15; CPD, 28 September 1927, p. 20; Advertiser (Adelaide), 25 July 1927, pp. 9, 11; Argus (Melbourne), 25 July 1927, p. 14. This biography was first published in The Biographical Dictionary of the Australian Senate, vol. 1, 1901-1929, Melbourne University Press, Carlton South, Vic., 2000, pp. 205-207.